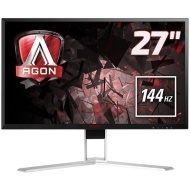 alaTest has collected and analyzed 54 reviews of AOC AG271QX. The average rating for this product is 4.5/5, compared to an average rating of 4.4/5 for other products in the same category for all reviews. People really like the reliability and design. The price and size are also mentioned favorably. We analyzed user and expert ratings, product age and more factors. Compared to other products in the same category the AOC AG271QX is awarded an overall alaScore™ of 95/100 = Excellent quality. Mid-range price gives tough competition. Excellent built quality. Easy set up. Loads of accessories in the box. - Very simple to attach the mounting arm. - Lovely picture quality. - Very smooth height and turn adjustability. - No manual (maybe one on the disk. I don't have a CD drive on my PC) - Slightly on the expensive side, but I think it's worth it. Once calibration is done, the screen quality is amazing, easily on par with my IPS displays, which is quite impressive for a TFT screen. Did need a fair bit of calibration out of the box. was very light initially but the picture options do allow a lot of freedom to get it just right. Screws to attach stand were missing from the box. Great quality when sat alongside my old screen, everything is crisp and very satisfying. Not had a chance to play around with all the settings yet but looking forward to it. took a lot of screwing to ensure the bracket was on tight. Going from a 1080p 24inch to this was a massive jump. Playing most games on 1440p with high settings on my 4GB RX480.